Kanger Protank 3 Review: Top Features, Ratings, Pros & Cons! Home → Tanks → Sub-Ohm → Kanger Protank 3 Review: Top Features, Ratings, Pros & Cons! Salutations once again to all you wonderful cloud forming enthusiasts out there! Now, as you know I’m a huge fan of Kangertech’s impressive range of high performance vaping products. I’ve already had the pleasure of sampling a number of Kanger’s outstanding range of devices and I couldn’t be more excited that I’m able to bring you this review today! By now you may already know Kanger as one of vaping's most trustworthy and popular brands. With a constant stream of impressive and affordable vaping systems being added to their range, Kangertech is constantly striving to bring you compatibility, as well as a quality, affordable vape. In this review I’m going to take a closer look at all the upgraded features of Kanger’s new dual bottom coil clearomizers. I’ll also include my Kangertech Mini Protank 3 review in this feature. I can already tell that the dual coil system is bound to be an improvement over Kanger's Protank 2 range. The Protank 3 also boasts a 510 connection so you won’t need to fork out for an adapter. I went ahead and filled up with my Berry flavored Gush e-Juice and set about putting the system through a couple of days of pretty intensive use. Let’s get started and see how the new system fared in this Kanger Protank 3 Review. Kanger has once again impressed! The new dual coil tank system on both the Protank 3 and Protank 3 Mini is undoubtedly a formidable upgrade over the Kanger Protank 2 and an awesome addition to Kanger's Protank family. So, at the end of this review I’m thrilled to say I’ve awarded the new clearomizer system with a well deserved 4.5 Stars. Well, this weekend, I exposed both the Protank 3 and Protank 3 Mini to some pretty vigorous vape action and all I can say is that I’m extremely impressed with the quality of both products and found the performance on both pieces to be well worth the money spent. 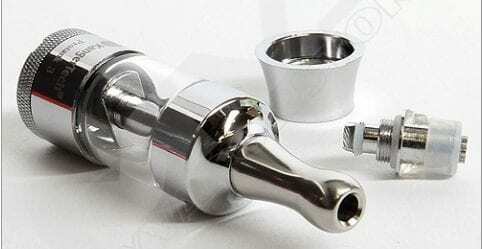 The vapor production and flavor quality on both clearomizer systems is more or less consistent through both products, except of course that the vape is a little lighter on the smaller 1.5ml Protank Mini. Looks: Okay, so at first glance there is very little difference between the looks on the Protank 3 vs it’s predecessor, the Protank 2. But, on closer inspection, you’ll see that that there is a definite difference in the replaceable coils. The Protank 3 features higher performance, dual coils, which provide more flavor as well as a much richer vape. The Pyrex tank, which comes in 5 awesome shades, together with the sleek look of the stainless steel body and drip tip make for a product that looks really decent, whilst still being really affordable. Refill: The Protank 3 is really easy to disassemble and clean or refill, everything can be unscrewed down to the smallest components, which are all replaceable. The bottom coil system on both the Protank 3 and the Protank 3 Mini means that you unscrew the base from the bottom of the Pyrex tank and refill from the underside. Compatibility: The handy 510 connection on the new Protank 3 Range means that you’ll not need to spend extra cash on an adapter to fit your battery. Quality of Vape: The replaceable, dual coils on the Protank 3 and Protank 3 Mini are definitely an improvement on the previous Protank systems. I vaped long and deep on both products, testing various wattages, all the way up to 12 watts on the bigger model and I was pleasantly surprised by the quality delivered all round. The draw is easy and not as airy as the prior system, very smooth. The system delivers an extremely flavorful, rich and full vape, warming up a little at the higher wattage. In my experience, no leakage and really great staying power. The only possible, minor inconvenience is the fact that the dual coil system means that your Protank 3 clearomizer won’t work on your Protank 2 base. Other than that, I was wholeheartedly impressed with what I got for the money. Quality, Performance and Range. At a very affordable price, Kanger has once again delivered top quality and performance, with a Range to suit anyone’s needs or budget. Kudos to Kanger for once again delivering. For anyone keen on upgrading from a Protank 2 or the like, this would be an awesome upgrade. With all the parts being fully replaceable, the pack is highly economical and you won’t be disappointed with the smooth, rich vape on either product. I definitely didn’t take it easy on the system during this review and the new dual coil clearomizer held out so well after the sustained use that I think I’ll make this my go to tank for a little while longer. If you are planning to make the move from those nasty cigarettes and are looking for an affordable vaping system that delivers on performance, quality of flavor and range then you really can’t go wrong with the Kanger Protank 3 or Protank 3 Mini. Go on, let’s go make some clouds!